This artist's concept illustrates a dead star, or white dwarf, surrounded by the bits and pieces of a disintegrating asteroid. The scene suggests the raw material for planets like Earth are common. LONG BEACH,Calif. ? New observations of chewed-up asteroids around old dead ?stars calledwhite dwarfs bolster the idea that the Earth and other rocky planets in oursolar system are far from alone in the universe. 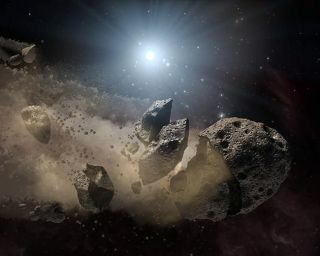 Astronomersused NASA's SpitzerSpace Telescope to peer at six such white dwarf stars and found thesignature of asteroid debris circling the stars. An analysis of the lightcoming from the systems show the rings are made of some of the same materialsas rocky bodies in our own solar system. "Itstrengthens suspicions that Earth-like planets are common," said MichaelJura of UCLA here Monday at the 213th meeting of the American AstronomicalSociety. Asteroidsand planets form from the dust and gas that swirls around young stars. As thedust sticks together, it forms clumps that eventually become full-fledgedplanets, according to the leading theory. Asteroids are the "leftoverbuilding blocks that didn?t get incorporated in the planets," Jura said. As starslike our own sun near the end of their life, they puff up into red giants thatconsume their innermost planets and jostle the orbits of outer planets and asteroids.Eventually the stars blow off their outer layers and shrink down into whitedwarfs. Spitzer hadpreviously observed shredded asteroid pieces around two white dwarfs; the newobservations bring the total count (of white dwarfs with asteroid debris) toeight. "Nowwe?ve got a bigger sample of these polluted white dwarfs, so we know thesetypes of events are not extremely rare," Jura said, noting that they about1 percent of white dwarfs are estimated to have these signatures. All eightwhite dwarf systems observed showed signatures of a glassy silicate mineralsimilar to olivine, which is common on Earth. "Thisis one clue that the rocky material around these stars has evolved very muchlike our own," Jura said. The spectra(light broken into its components) of the asteroid debris also showed no carbonsignature ? what Jura calls a "carbon desert" ? another similarity tothe asteroids and rocky planets in our own solar system, which have relativelylittle carbon. Asingle asteroid is thought to have broken apart within the last millionyears or so in each of the eight white-dwarf systems. The biggest was onceabout 124 miles (200 km) in diameter, a bit larger across than LosAngeles County. Continuedobservations of this white dwarf debris could help astronomers further figureout the composition of exoplanets, which so far has proven difficult.